The landline phone is becoming something of an endangered species these days; most of us simply prefer to carry our multi-functional mobile phones with us. 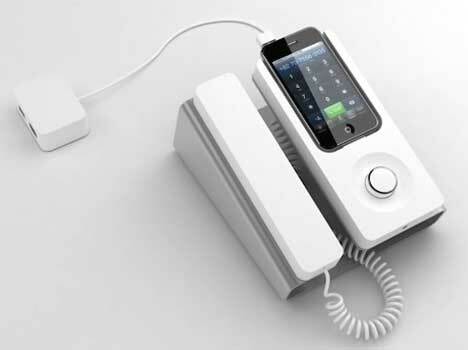 But there’s nothing wrong with a little indulgent nostalgia, which is just what this fun iPhone dock looks like. 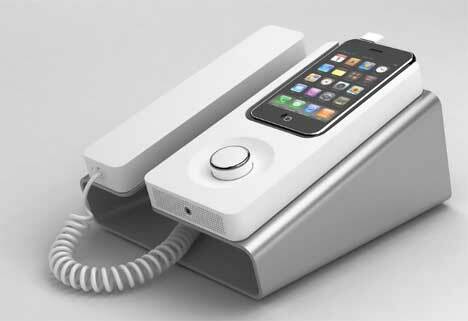 It turns your iPhone into a corded desk phone, complete with speakers and a USB plug. Your phone will charge and sync while it’s plugged in, and you get to pick up the handset when it rings and remember the good old (though not-too-distant) days. The product isn’t without its fair share of irony. After all, you pay good money to have the freedom of living without cords, right? But the visceral satisfaction of slamming the phone’s receiver down at the end of a heated conversation will no doubt be worth the slight sense of ridiculousness you’ll probably feel while using it. The dock also features a mute button and, of course, can be used to listen to music while your phone is charging. There aren’t many details available yet – no release date or price have been announced – but the Desk Phone Dock will be introduced at the 2010 China Sourcing Fair. But more importantly than all of the absent information is the fact that you can’t help but love a product with a conceptual commercial this adorable. See more in Phones & Mobile or under Gadgets. April, 2010.